E.W. Minchew, Bracknell, Berkshire, England, by 1926. Charles Brunner, Paris, before 1928. Andrea Busiri Vici, Rome, 1970.
with Stair Sainty Matthiesen, New York, by 1987. A. Busiri Vici, Opere Romane di Jean de Troy, Antichita Viva, IX, no. 2, 1970, p. 10, fig. 9. Atlanta, High Museum of Art, La Grande Manière. The subject of De Troy's painting comes from the Book of Tobit in the Apocrypha of the Old Testament (11: 2-13). Tobit, a devout Jew living in Syria in the 8th century B.C., lost his sight as the result of a curious accident: while resting in the open, sparrows' droppings fell into his eyes, infecting them and leaving the old man blind. Believing that he was soon to die, Tobit instructed his son, Tobias, to journey to Media to collect on certain debts. Looking for a travelling companion, Tobias met the archangel Raphael, who agreed to accompany him on his journey. When they reached the River Tigris, Tobias went bathing: suddenly, a great fish leapt from the water and would have swallowed the young man if Raphael had not instructed him to catch the fish, gut it and set aside its gall, which, the angel said, would restore Tobit's sight. 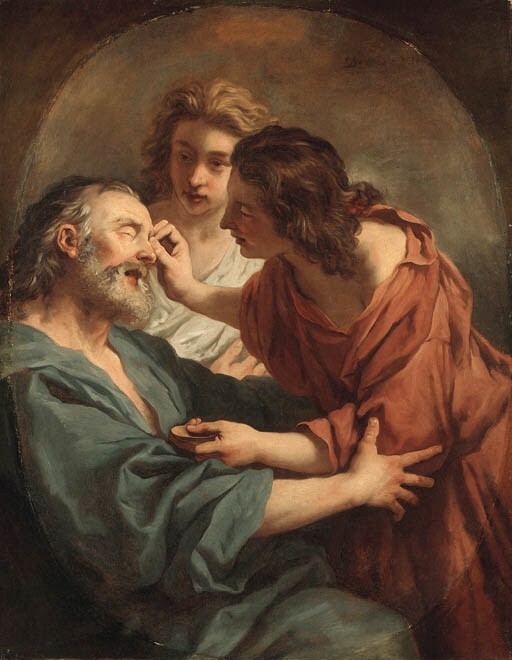 Upon their return to Nineveh, Tobias blew the fish-gall into his father's eyes, 'then, when he had put the medicine on and applied it, using both hands he pealed off the patches from the corners of Tobit's eyes. Tobit flung his arms around him and burst into tears. 'I can see you, my son, the light of my eyes!' he cried. 'Praise be to God, and praise to his great name, and to all his holy angels. May his great name rest upon us. Praised be all angels for ever. He laid scourge on me, and now, look, I see my son Tobias!''. De Troy pared the story to its essence, eliminated any picturesque details, and created a powerful and monumental composition with only the three interlocked protagonists, galvanized at the instant of miraculous recovery. Andrea Busiri Vici, who once owned the painting, detected the influence of Rembrandt in it, and certainly its dramatic use of light and shadow, and emotional intensity, may reflect the impact of the Dutch master on De Troy. But the author was mistaken in his belief that its 'pictorial maturity' marked it as a late work from De Troy's years in Rome (1738-52), when the painter was serving in the Eternal City as director of the French Academy. Cleaning revealed a date beside De Troy's signature that--despite an uncertain final digit--clearly indicates that the picture is from the early 1730s, before the artist left France. Christophe Léribault, who knows the painting from a photograph, confirms that its handling conforms to De Troy's style in the early 1730s; he will include it in his forthcoming catalogue raisonné of De Troy's paintings.